What does the deposed strongman say to the upstart revolutionary? 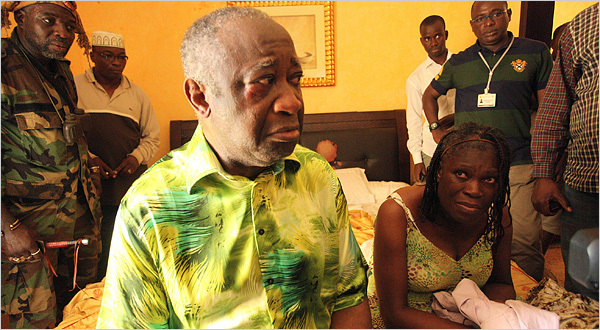 “My electrodes, my electrodes, my kingdom for a pair of electrodes to attach to your testicles.” Laurent Gbagbo is the latest of the recent crop of despots whose reigns have been cut short by popular unrest, foreign intervention, or both. Hopefully Qaddafi will follow. Robert Mugabe remains steadfast, as does Alexander Lukashenko of Belarus and the entire Kim Jong-il Jung dynasty, whose plans for succession are a constant source of curiosity among western intelligence services. Idi Amin Dada and Papa Doc Duvalier were their forebears, along with Romania’s Ceauşescu and, long before him, Stalin, Hitler and Caligula. Gbagbo, it turns out, was a darling of the American right, with Glenn Beck, Pat Robertson and Republican James M. Inhofe, who belongs to both the powerful Armed Services and Foreign Relations committees, among his fans (“A Strongman Found Support in Prominent U.S. Conservatives,” NYT, 4/12/11). The Times commented that Inoufe “visited Ivory Coast nine times and knew Mr. Gbagbo and his wife Simone.” Gbagbo, according to the Times, participated in the National Prayer Breakfast, which is run by the Fellowship, “a secretive evangelical Christian organization.” Gbagbo was apparently preferred over his rival Alassane Ouattara, who happens to be a Muslim. Still, the picture of Laurent and Simone that graced the front page of the Times on Tuesday was almost touching. One moment they lived in a luxurious villa, defying election results and international delegations, seemingly implacable in their resolve to refute the forces of progress; the next they were heavily guarded in a hotel room. Aristotle defined tragedy as the fall of a once great man. There is no doubt Gbagbo has fallen. But with genocidal murder and the repression of a population at the top of his resume, one would need a broader definition than Aristotle’s to understand the tragic path of destruction sown by Gbagbo and his ilk.